SAPANTA, Romania - Death, when it visits this isolated town in a forgotten corner of Europe, comes laughing - in the guise, almost, of a comic book. While alive, the people of Sapanta's 1,500 hearths eke out a rudimentary existence, tilling dark brown fields with horse-drawn plows, carding and spinning wool for thick blankets woven on burnished wooden looms, tending flocks of bleating sheep and saturnine cows. On Sundays they distill copper vats of fermented fruits for their potent liquor, tuica (pronounced TSUI-ka), attend Orthodox church services and gossip at the bus stop or the cafe dressed in colorful folk costumes. 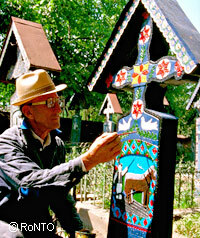 But when a citizen of Sapanta dies, Dumitru Pop, a farmer, woodcarver and poet, gathers his notebook, chisels and paintbrushes and prepares to carve a poetic and pictorial homage of the deceased onto an oak grave marker in what villagers now call the Merry Cemetery, beside the Church of the Assumption. The 800 or so carvings - a festival of color - show the dead either in life or at the moment that death caught them, while the poems, mostly in a simple iambic tetrametre, are a final apology for an often ordinary life. 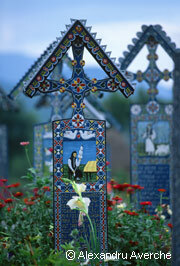 "The epitaphs," explained Mr. Pop, "were conceived by the Master, a message from the dead man to the living world." The Master was Ioan Patras Stan, a carver who scrawled his first verse on a tomb around 1935 and recorded the town in poetry until his death in 1977, when Mr. Pop, his apprentice, took over. There is the rare flash of anger, as with the epitaph for a 3-year-old girl whose name is no longer visible on the headstone but apparently perished in an auto accident. Sometimes the headstones are a warning. 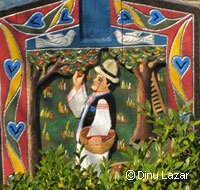 Dumitru Holdis was overly fond of Sapanta's moonshine. A black skeleton grabs his leg as he lifts a bottle to his lips, and his epitaph denounces tuica as "real poison." "What is on the stone is the truth," said Mr. Pop, 46, sitting in the main room of Mr. Stan's old wooden farmstead, where he now lives. In a small town, he said, "there are no secrets." On Sundays, Mr. Stan walked about town eavesdropping on gossip, taking notes in a small book. Another source of inspiration is the wake, when friends and relatives gather to tell jokes and write a lengthy poetic tribute, called a vars. Where Mr. Stan was self-taught and never attended school, Mr. Pop is an avid reader of Romanian literature and a great fan of the nation's 19th-century poet Mihai Eminescu. Mr. Pop said that his own poems, while keeping touches of the local dialect, are much closer to literary language than Mr. Stan's. The only problem, said Mr. Pop, is that in a small town, there is not much to differentiate the routines of the inhabitants. "Their lives were the same but they want their epitaphs to be different," he said. In the summer months after he has planted his nine acres with horses borrowed from a neighbor, he begins to carve the grave marker. Wood is a natural choice in a town where many houses are still made from logs neatly dovetailed and the roofs are sheathed in wooden shingles. Mr. Pop chooses an oak from nearby forests and fells it himself. The carving is done with hand chisels at a bench in an open-sided room alongside the cowshed. A table saw for slicing planks is his only concession to progress since the Master died. Paints are still a problem - those who can afford it hire Mr. Pop's three apprentices to repaint the grave markers of their relatives every 15 years or so. The living room of Mr. Stan's old house is a gallery of his carvings - and polychrome pinups of his favorite folk musicians. Until last year, when a phone call came from the museum in the county seat of Sighetu Marmatiei, there were also portraits of Romania's brutal Communist dictator, Nicolae Ceausescu, and his equally reviled wife, Elena. Mr. Pop says he has the portraits locked away, awaiting the next change in Romania's political winds. "In time, they will come back on the wall," Mr. Pop said, reflecting the accumulated wisdom of Eastern Europeans who have seen many isms prevail over the last century. 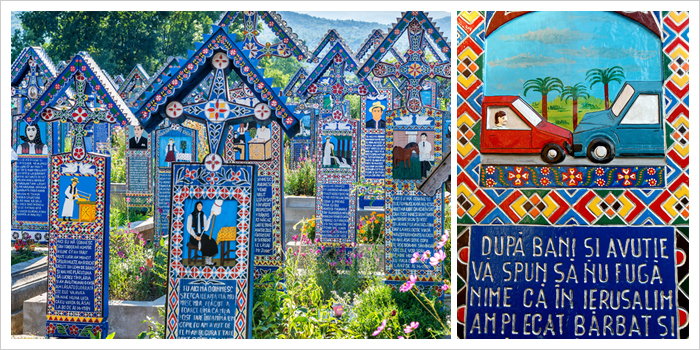 Ethnologists say Sapanta's laughing cemetery is likely a reflection of attitudes that come from the time of the Dacians, early inhabitants of Romania, and have been passed down in folklore ever since. The historian Herodotus said the Dacians were fearless in battle and went laughing to their graves because they believed they were going to meet Zalmoxis, their supreme god. The Rev. Grigore Lutai, Sapanta's Orthodox priest, concurs. "The people here don't react to death as though it were a tragedy," he said. "Death is just a passage to another life."